Jerome Badanes, the author of the cult novel, The Final Opus of Leon Solomon, makes a posthumous appearance with this immensely powerful poetry collection. Written at the height of the anti–Vietnam War movement, these poems bring together disparate threads of this century’s historical epochs—World War II, the rhythms of the post-Beat era, and the atmosphere of 1960s and ’70s America. These moments are reanimated by Badanes’s poems, which continue to resonate with today’s political and cultural climate. This timeless and haunting volume, assembled by Badanes himself, gives us another chance to experience the work of this compassionate existentialist. 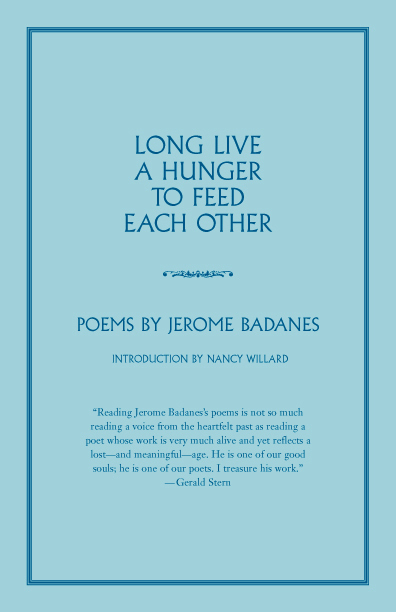 Jerome Badanes was a novelist, poet, and screenwriter who died in 1995 at age fifty-eight. A professor at Vassar, Sarah Lawrence, and SUNY Purchase, Badanes was born and raised in Brooklyn. He won an Avery Hopwood Award for Poetry at the University of Michigan, and spent much of the sixties as an antiwar activist, staging street theater. 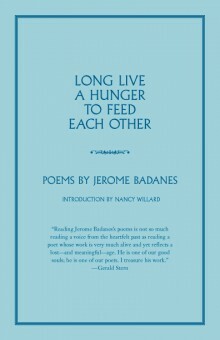 Ten years after Jerome Badanes died on a May morning in 1995 on his way to teaching his writing class at Sarah Lawrence, I was asked to speak about poetry to a group of writers at Columbia, and during the discussion, a subject came up that sometime in their lives all poets ask themselves: What makes a poem last? I thought of a spring day in Manhattan in 1965, when Jerry took several friends for a walk across the Brooklyn Bridge and paused to point out the last fourteen lines of his long narrative poem “From Brooklyn to Manhattan on the D Train” he had penciled on the surface of a girder. I whistle across water at Brooklyn Bridge. Birds burst from my lips toward Brooklyn Bridge. The setting sun hums on Brooklyn Bridge. and a man lame with love to build that bridge? Look at that bridge just look at it! The old buildings are blinking with proverbs. Beauty is slitting to a close above us. We vacuum back into darkness oh creature! on the moon lighted planet America. Like Galway Kinnell and William Carlos Williams, Badanes understood the art of packing the sounds and signs of the American landscape into a long poem, and haunted by Whitman’s generous voice, he was on his way to finding his own place in American poetry. When Williams wrote, in Book II of Paterson, “What do I do? I listen . . . This is my entire occupation” he might have been speaking for Badanes, whose ear for the poignance and humor shining just under the skin of ordinary speech shapes his poems. Seldom has a poet taken that advice as seriously as Badanes did when he was interviewing Holocaust survivors for the 1981 documentary film, Image Before My Eyes, and found himself haunted by their voices. In the seventies Badanes’s political involvement in the antiwar movement turned him away from writing poetry to writing for and performing in street theatre, and finally to writing fiction, from which emerged, many years later, his major work, a novel of the Holocaust published by Knopf, The Final Opus of Leon Solomon. In the brief interview that accompanied Edith Milton’s New York Times review, Badanes commented on these changes. “You get wised up to leave your own roots and then you get wiser—you return.” At the time of his death he was at work on a second novel, Change or Die. This volume of Badanes’s poetry, which he himself assembled, invites you to meet the artist as a young man through the poems he wrote from 1962 to 1975. Timeless and haunting, they stand on their own.